KIEV, Ukraine -- What a stark difference between Viktor Yanukovych’s first trip to Washington D.C. as president and that of his predecessor five years ago, the then newly elected President Viktor Yushchenko. 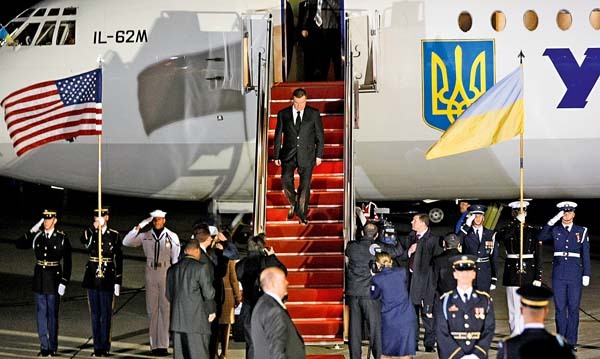 Ukrainian President Viktor Yanukovych arrives for the nuclear security summit on April 11 at Andrews Air Force Base in Maryland. Leaders from 47 nations pledged to reduce the threat of nuclear terrorism. Ukraine agreed to surrender 90 kilograms of enriched uranium which could be used to make bombs. In 2005, Yushchenko was greeted enthusiastically by U.S. President George W. Bush. The hero of the recent Orange Revolution was accorded the rare privilege of addressing both houses of Congress whose members, many displaying their reverence by sporting orange ties or shawls, listened to the man who seemingly promised to lead Ukraine into a golden future. Even at that early stage, though, there were disturbing signs that the hero had feet of clay. In Ukraine, politicians, journalists and others waiting for an audience with Yushchenko had grown used to his notorious tardiness which often kept people waiting for hours. In the first flush of adoration, though, that bad habit was usually overlooked or excused. However, when he was an hour late for a reception organized by two of D.C.’s most respected politicians, Republican heavyweight U.S. Sen. John McCain of Arizona and former U.S. Secretary of State Madeleine Albright,there was a glimpse of the hubris that would come to characterize Yushchenko’s presidency. Yushchenko’s invitation to the U.S. capital symbolized the enthusiastic support offered him by the world’s key democracies, when Ukraine was handed its best chance, probably ever, to emerge as a respected and important player on the international stage. Instead, Yushchenko broke his election promises, betrayed his supporters, embraced those he had formerly (and correctly) called criminals, presided over a dizzying rise in corruption, squandered a myriad of opportunities to introduce vital reforms, and embarrassed his political well-wishers in D.C., Brussels and elsewhere. The best thing about Yushchenko’s presidency is that it is over. But in the course of it he shattered the expectations of Ukraine’s international friends. Yanukovych is faced with an ostensibly gargantuan task to regain a semblance of international trust for Ukraine. However,from another perspective, because Yushchenko has bequeathedhim such a low benchmark of expectation, it does not require Yanukovych to do that much to make him shine in comparison to his dismal predecessor. The change in president and government provides Western countries and institutions with an opportunity to remodel the way they engage with Ukraine. Yushchenko used to promise great things to D.C. and Brussels while delivering little or nothing. He was indulged to a great extent and allowed to get away with reneging on those promises, including economic reforms and combating massive official corruption, because he was viewed as a friend. Western countries shied away from criticizing Yushchenko because it took a long time for people to realize that Yushchenko was a petty person of little vision, full of hot air and unwilling to take any hard decisions. He was offered a lot of carrots but Western countries were reluctant to use a stick against someone viewed as broadly in their camp. No such considerations need apply to the West’s dealing with Yanukovych. The West owes nothing to Yanukovych or his administration but that makes putting relations onto a much more business-like plane easier. Nobody should have any illusions that Yanukovych will develop a patriotic love of Ukraine and that the influences and loyalties that have governed his behavior as he rose within the Donetsk “business” clan are now a thing of the past. His first loyalty will continue to be to the shady clan rather than Ukraine. His interest in Ukraine will almost certainly always be akin to that of a gang member protecting his turf rather than anything bound up with patriotism of the well being of the nation. But although he may confer some sort of special status on dealings with Russia and cede a lot to Moscow, his clan interests will dictate that he doesn’t give too much away. The businessmen of the Donetsk clan who propelled Yanukovych to power want to be big fish in a Ukrainian pool rather than small ones in a Russian alligator swamp. And members of these mafia-like clans do operate by some rather strict rules so that, ironically, Yanukovych may be more likely to keep his word than Yushchenko. Another powerful stick in Western hands is that, although many business people associated with Yanukovych have murky or downright criminal pasts, they know they have to change their image if they want to expand their businesses with the help of western creditsor to raise capital by floating their companies on Western stock exchanges. The West should push for economic reforms in Ukraine; for business transparency; to clean out the justice system so that western businesses and investors get real protection for their assets without being milked for bribes or swindled by the tax authorities by making any loans contingent on demonstrable improvements in all those areas. The message should be that Ukraine will only be able to expand into the West of it allows the same conditions to become the norm in Ukraine for Western businessmen as it seeks to exploit in the West. Failures by the Ukrainian side should prompt immediate and severe use of the stick. Obviously, Ukraine should also reward good behavior. Yanukovych has been praised for his nuclear initiative during his D.C. trip and those plaudits should be accompanied by a tasty carrot. Apart from loans or financial aid, the West has a whole larder of juicy carrots. Yanukovych’s declaration about wanting closer ties with the European Union should be taken at face value. Brussels can provide a huge incentive for Ukraine to introduce reforms that will benefit both Western countries and Ukrainians if it clearly outlines a route for EU membership, as long as Kiev adheres to a clearly understood set of criteria. The time frame may be a long one but that need not mater as long as there is something to aim for. The promise of eventual EU membership has worked wonders for Turkish democracy and its economy for three decades despite the fact no date was ever set. One of the most important inducements is a more flexible visa regime to Western Europe and America that would stem the bitterness born of the humiliating hurdles placed before rich and poor Ukrainians alike who want to venture out of their country. Western policy has to be tough towards the new Ukrainian government but it has to be applied judiciously. Moscow gleefully thinks that a Yanukovych presidency will let them, in all but name, to re-incorporate Ukraine into some kind of new empire. Moscow will hold out financial temptations to get its way in Ukraine. Although Russian gas prices have not been decreased, cheaper gas and other gifts will be offered to bind Ukraine closer to the Kremlin. So tough Western measures on Ukraine have to be tempered with the offer of benefits that do not tilt Kiev too far towards Moscow. It should be made clear that the years of Western indulgence for a delinquent Kiev are over and Kiev will only receive help and privileges by earning them. The stick has to be used wisely but it does have to be used un-hesitatingly, if necessary. Sticks are something the likes of Yanukovych and his closest cronies understand. After all many of them have wielded baseball bats while not actually playing the sport.